A central goal of research for targeted cancer therapy, or precision oncology, is to reveal the intrinsic vulnerabilities of cancer cells and exploit them as therapeutic targets. Examples of cancer cell vulnerabilities include driver oncogenes that are essential for the initiation and progression of cancer, or non-oncogene addictions resulting from the cancerous state of the cell. To identify vulnerabilities, scientists perform genetic “loss-of-function” and “gain-of-function” studies to better understand the roles of specific genes in cancer cells. In this article, we describe the genetic engineering system clustered regularly interspaced short palindromic repeats/CRISPR-associated protein 9 (CRISPR/Cas9) and how it is used to perform loss-of-function and gain-of-function experiments in a high-throughput manner1. We then explore how these studies can be applied to identify vulnerabilities, find new drug targets, and better understand how cancer cells develop drug resistance. The CRISPR/Cas9 system was first discovered in bacteria, which use it as an immune mechanism to degrade viral and plasmid DNA2. Scientists have since modified this system to edit and study genomic DNA in mammalian cells. Engineered small guide RNAs (sgRNA) target Cas9 to specific DNA segments, where it introduces double-stranded cuts in the DNA. This DNA damage activates a normal but error-prone cellular process to repair double strand breaks. Thus, CRISPR/Cas9 cutting frequently introduces DNA mutations and results in complete loss-of-function of the targeted gene (Figure 1A). Scientists have exploited this approach for mammalian loss-of-function experiments2. Several research groups have enhanced the CRISPR/Cas9 system by incorporating a catalytically dead Cas9 (dCas9) fused to other functional proteins2. dCas9-fusion proteins are recruited to DNA sequences via sgRNA, but the catalytically inactive dCas9 cannot cut the DNA. Instead, the proteins fused to dCas9 manipulate transcription of the targeted genes. RNA polymerase mediates transcription and several factors affect the ability of RNA polymerase to bind DNA. For example, transcription repressors inhibit RNA polymerase binding while transcription activators promote binding. The CRISPR system with dCas9 was modified to alter transcription by taking advantage of these factors. When dCas9 is fused to Kruppel associated box (KRAB), a transcriptional repressor domain, transcription is repressed and the system is referred to as CRISPR interference (CRISPRi)2 (Figure 1B). Compared with CRISPR cutting approaches, CRISPRi is inducible, reversible, and non-toxic; it also enables knockdown of non-coding RNAs1. 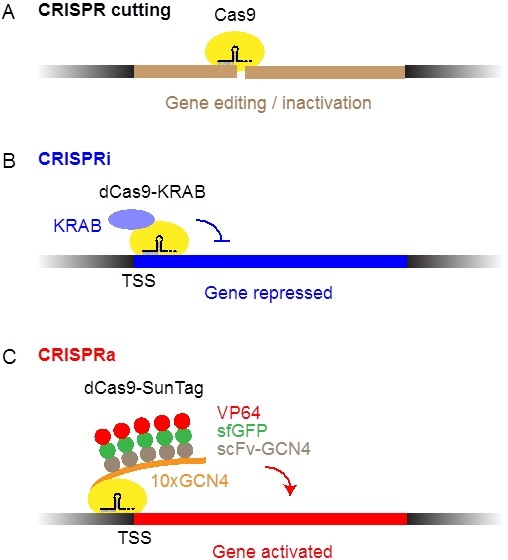 When dCas9 is fused to the SunTag, a sequence containing multiple copies of the activator recruitment domain of general control protein (GCN4), the system activates transcription and is referred to as CRISPR activation (CRISPRa) (Figure 1C). The SunTag3 recruits multiple copies of various proteins, such as a tandem array of the transcriptional activator virus protein 16 (VP16) to activate transcription in a robust manner. Together, CRISPRi and CRISPRa enable control of gene transcription by several orders of magnitude and have been shown to exhibit few off-target effects, meaning the technique primarily affects only the intended genes1. Figure 1. Variations of CRISPR/Cas9 used for genetic screens: (A) CRISPR cutting: Catalytically active Cas9 is directed to coding sequences to introduce DNA breaks, which are subject to error-prone cellular repair. (B) CRISPRi: Cas9 lacking the cutting function (dCas9) fused to a transcriptional repressor (KRAB) domain is recruited to the transcriptional start site (TSS) of genes to repress their transcription. (C) CRISPRa: dCas9 fused to a SunTag, an epitope tag containing 10 copies of GCN4, which recruits VP64 transcriptional activators and superfold green fluorescent protein molecules (to improve protein solubility) to the TSS to activate transcription. To reveal cancer vulnerabilities, CRISPRi and CRISPRa can be used in genetic screens to alter the expression of single genes, or to alter two genes to detect genetic interactions and thereby reveal pathway relationships. Synthetic lethality is a situation in which cells may viably carry mutations in two different genes independently, but if a single cell has mutations in both genes, the combination is lethal. Synthetic lethality can be exploited in cancer therapy; this is especially useful when a gene cannot be targeted pharmacologically, but targeting its synthetic lethal gene partner induces cell death. Synthetic lethal gene pairs are rare and difficult to predict. Previously, we used another genetic manipulation technique, short hairpin RNAs, to systematically map genetic interactions for large sets of genes in mammalian cells4,5. The inherent off-target effects of shRNAs required that we target each gene using three independent shRNAs in a double-shRNA library. CRISPRi dramatically reduces off-target effects, which reduces the number of sgRNAs required per gene to one or two, enabling us to screen up to 9 times as many gene combinations in an experiment of a similar scale. For example, we could perform a CRISPRi screen of ~250,000 gene combinations using the same number of cells as we use in an shRNA screen of ~26,000 gene combinations. Experiments using CRISPR technology will allow researchers to test more gene combinations with more complete control and more readily identify synthetic lethal gene pairs. Importantly, CRISPRa will now make it possible to include gain-of-function variant genes in genetic interaction maps. These are highly relevant from a clinical point of view because we currently do not have targeted therapies available for many gain-of-function oncogenes, such as Kirsten rat sarcoma (KRAS). The discovery of synthetic lethal relationships from such loss-of-function and gain-of-function screens could guide the development of new therapeutic strategies. While using targeted drugs to treat cancers has enormous potential, two clinically relevant challenges include predicting which patients will respond to a targeted drug, and overcoming the frequent problem of drug resistance. Functional genomic approaches can pinpoint genes that control the sensitivity of cancer cells to drugs. Such genes are potential biomarkers for matching cancer patients with targeted drugs and providing insights into possible mechanisms of drug resistance. The CRISPRi “knock-down” system has a special advantage over “knock-out” screens because sgRNAs can be engineered with point mutants to vary the targeting ability of the sgRNAs and create different levels of targeted knockdown. Gene expression can be modulated to study how cells behave when an essential gene is expressed at low levels. In a previous shRNA-based screen for genes controlling sensitivity to the proteasome inhibitor carfilzomib in multiple myeloma cells, we found that partial knockdown of essential components of the 19S proteasomal regulator paradoxically confers carfilzomib resistance6. In agreement with this experimental finding, multiple myeloma patients with lower levels of 19S subunits did not respond as well to carfilzomib-based therapy6. This suggests that components of the 19S proteasome could act as potential biomarkers for carfilzomib resistance. Our study also predicted suitable and unsuitable targets for combination therapy with carfilzomib6. Importantly, drug resistance in cancer cells often involves gain-of-function events, such as gene amplification or point mutations. Such alterations can cause over-activation of proteins which can help resist the killing mechanisms of drugs. CRISPRa gain-of-function screens are ideally suited to reveal such mechanisms of drug resistance. CRISPRi/a is a less expensive and more efficient method of gene repression and activation that can be used in many applications to answer some of the most important questions in cancer genomics research, with the goal of improving clinical diagnostic and treatment approaches. By helping to identify cancer vulnerabilities and reveal mechanisms of drug resistance, CRISPRi/a are valuable tools that can ultimately be used to discover and better understand targeted therapies for precision medicine.